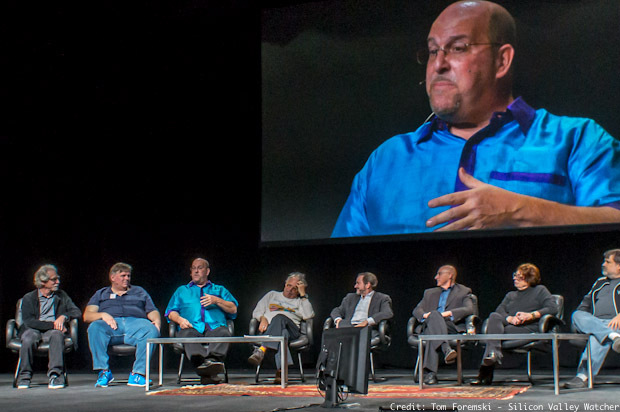 Marc Canter on stage and screen at a panel moderated by Dan Farber at the Mac 30 Anniversary event in January 2014. Marc Canter, a leading pioneer of multimedia technologies with his work at Macromedia 25 years ago, has launched Interface, a startup focused on authoring mobile apps across all major platforms. Canter says he hopes to emulate the power and popularity of authoring tools he helped develop at Macromedia, which led to an explosion of creativity in producing interactive media. At the time, CR-ROM based media titles were the only way rich interactive media could be distributed and presented on a computer. San Francisco in the late 1980s and early 1990s was at the epicenter of CDROM multimedia development and Canter was its leading figure. Canter is founder and CEO of Interface, He's recruited an impressive team of industry veterans and former colleagues, plus advisors such as top tech editor and journalist Dan Farber, and popular blogger Robert Scoble. Canter says that his inspiration for the venture came from a project he was considering based on the "Internet of Things." He realized that this future world of massive interconnectivity would require a great user interface otherwise it would be hard to make use of its potential. Authoring tools that "mere mortals" can use would be the key to success of for the Internet of Things. The easier those tools are to use the more apps will be developed, and more users of those apps will be enabled. "We're starting with an application framework for smartphones aimed at quickly developing apps for five different use cases based on people's daily activities, such as a personal trainer." If personal trainers, and others such as a life coach, home assistant, or a tour guide can use the authoring tools to create customized mobile apps for their clients, Canter believes this will prove that Interface has a great user interface. Canter says the choice of name is designed "to make you hate it. We're looking to standout and be seen." Interface is developing a series of frameworks for each user archetype so for example, the Personal Trainer app development tool is preconfigured to easily integrate Fitbit, and other digital sensors, into an exercise regime that can trigger music or words of encouragement at key points in the user's activity stream. Interface will be free for creating up to five mobile apps per user -- a generous allowance. Interface will also act as "the player" of the apps allowing it to hide the complexity of backend functions. The startup is starting to talk with investors and set its development schedule. Plans include a marketplace for Interface apps and additional tools for Internet of Things platforms.